There is a possibility that I might be teetering on the edge of obsession when it comes to my Instant Pot. 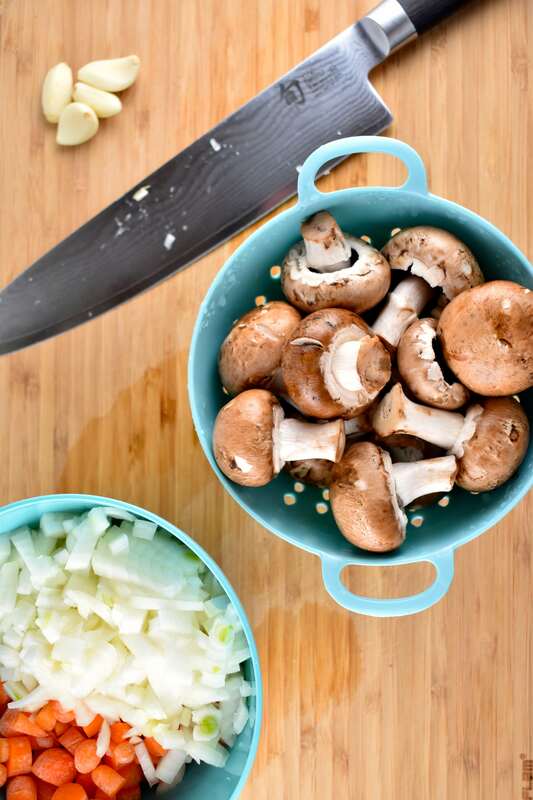 What is not to love about the idea of food being cooked faster, easier and healthier?! That’s why I’ve been churning out Weight Watchers Instant Pot Recipes like a madwoman. But the Instant Pot is pretty amazing and life changing, you guys. While I still love using a slow cooker, I am often one of those people who wait until the last minute to make dinner. The IP has really made my life a LOT easier for this exact reason. 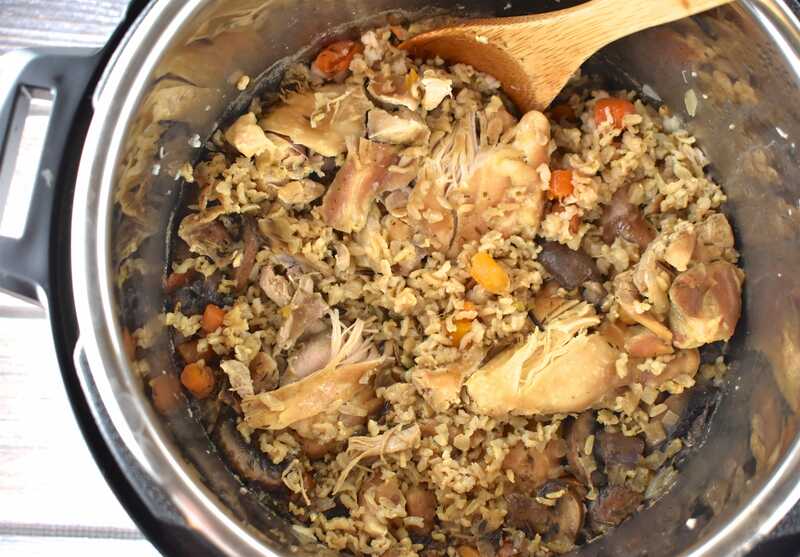 Today I’m sharing what has become one of my all time favorites – my Instant Pot Chicken and Rice recipe. I remade this comfort food classic into a healthier, Instant Pot version, so it cooks up quickly and easily, and is full of incredible flavors. I used chicken thighs in this dish, because I prefer the flavor of the dark meat here. Also, the extra fat and juices from the meat impart a decadent flavor to the rice that makes it totally worth those extra couple of Points. If you’d prefer to save those Points, and make this with chicken breasts instead, you absolutely can. Each serving would end up being just 4 Points instead of 6. But one word of caution here…once you make it with the thighs, there’s no going back to breasts. Trust. Another thing that’s great about this recipe is that it’s ALL done in one pot. One pot means less cleanup, and let’s face it, who doesn’t love having less dishes to scrub? It’s a complete meal….the whole gang is there…moist chicken, fresh veggies, whole grain brown rice. No need to make extra side dishes, so it’s ideal when you’ve got a busy day and little time to prepare dinner. I started by browning both sides of my chicken thighs on the saute setting. This gives the meat a nice flavor, and helps to lock in the juices. Then I transferred the chicken to another bowl, while I de-glazed the pan and sauteed the veggies. Then I rinsed the rice (don’t skip this step or your rice won’t come out as fluffy), added it into the pot, and topped it all with the chicken. The chicken cooked to perfection! It was so tender, I didn’t even need to shred it with two forks. It just mostly fell apart while I was scooping it out to serve. 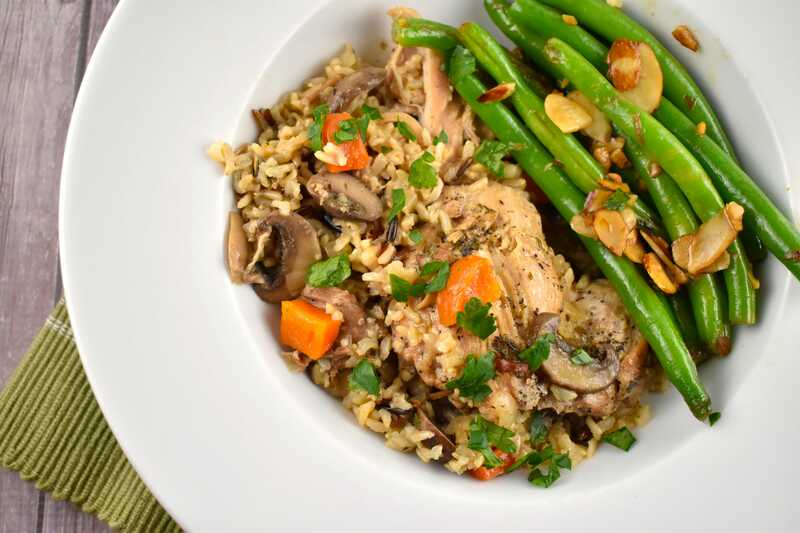 This Instant Pot Chicken and Rice has become my go to meal on the days my daughter has soccer practice. I have just enough time from when we get home from school to cook this meal entirely before we leave for practice. Then I just let it sit on warm while we are at practice. We get back around 6:30pm, and dinner is ready and waiting for us! 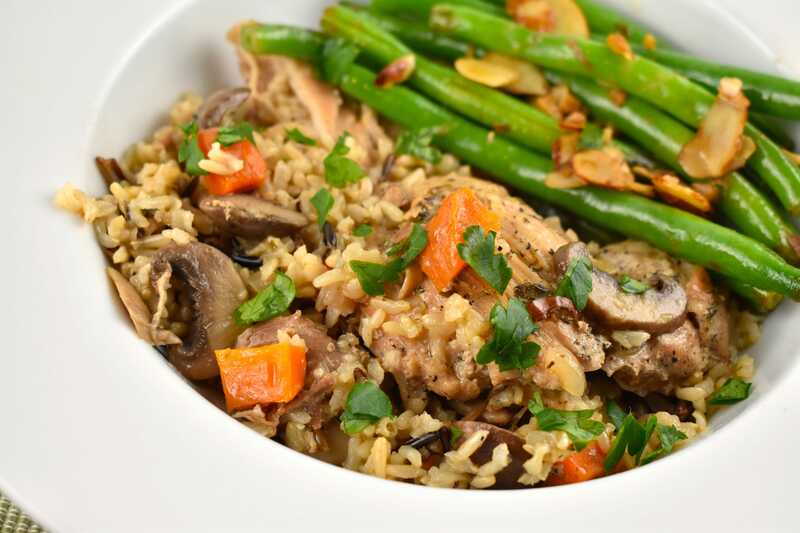 If you have an Instant Pot, I hope you’ll give this Chicken and Rice recipe a try, leave me a comment and let me know what you think. And if you don’t have an Instant Pot, what are you waiting for? You should definitely give it some consideration. Especially around Black Friday, because there are typically some good deals then. You’ll be so glad you did! CAN’T GET ENOUGH INSTANT POT RECIPES? CHECK THESE OUT! 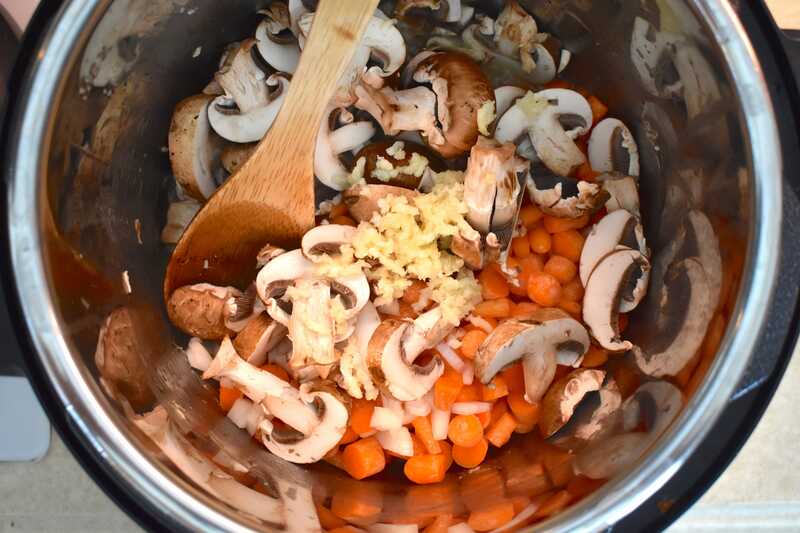 A deliciously simple and complete meal that you can make all in one pot. 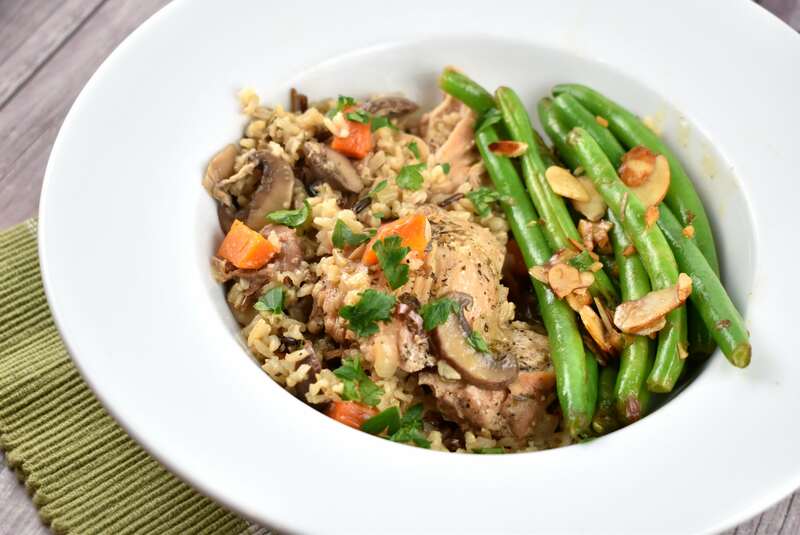 This healthy pressure cooker chicken and rice will become your new family favorite! Turn Instant Pot to “Saute”. When hot, add olive oil. Season chicken with salt and pepper, then in the chicken, and brown about 3-4 minutes on each side. Remove chicken and set aside. Deglaze the pot by pouring in ¼ cup of the chicken broth, and making sure to scrape up the browned bits on the bottom of the pan. Add in all the chopped vegetables, and saute for about 3 minutes. Stir in the remaining broth, thyme, lemon juice and rice. Add additional salt and pepper as desired. Top with the chicken. Turn off the “Saute” function. Lock on lid, select the “Manual” function and set to high pressure for 20 minutes. Allow to naturally release for 10 minutes, then manually release any remaining pressure. Transfer chicken to plates and serve! If I wanted to substitute cauliflower rice for brown rice, would I just add it with the veggies and skip the rice step? Should I adjust the cooking time any? Hi, could you explain how this recipe is only 6 points? When I did the calculations I came up with 12. Maybe f you’re counting the chicken thighs as zero points? Only chicken breast is on the 0 point list. Hi there! Based on the WW Recipe Creator, the chicken (24 oz, skinless, boneless, raw) was 14 points, the rice (Trader Joe’s Brown Basmati Rice, dry) was 19 points, the broth was 1, and the oil was 4. The WW calculator calculated that as 6 Points per serving. Maybe you calculated the chicken cooked and not raw? That can make a difference. Hope this helps! Just got an instant pot. Want to make this for my first recipe. I have brown instant rice. Will instant rice work or will it get too mushy? You can try it, but lower the cooking time to about 10 – 12 minutes. Although it was a bit mushy and greasy, it didn’t taste too bad. Any suggestions for next time? Hmmmm…if it was mushy, try using less broth. And if was greasy, try less oil. It was actually a mixture of brown rice and a bit of wild rice I had. 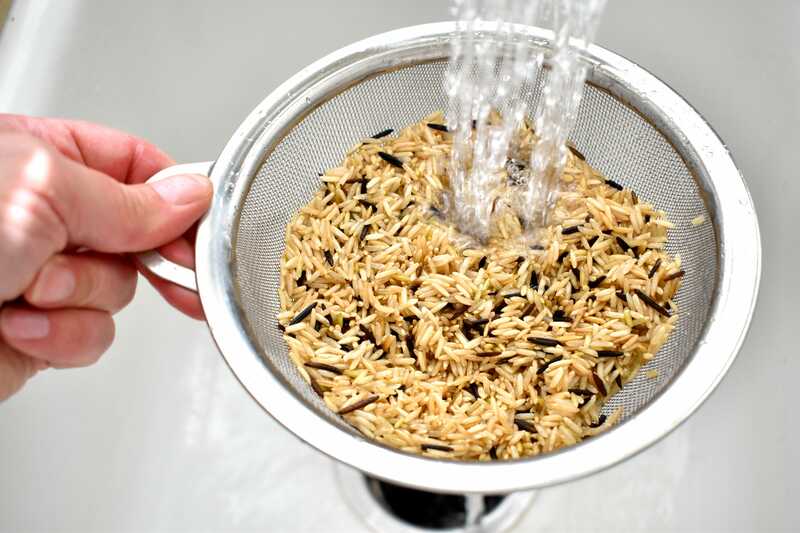 You can use all wild rice, if you prefer. It won’t affect the Points value. Made this tonight and while delicious, it came out very soupy. Wonder if your ratio of stock to rice was correct. Seems like it could have used another cup of rice. I read elsewhere and have used a recipe of 2 cups brown rice 2 and a half cups water and it’s come out really good. Wasn’t sure how to adjust to adding the chicken and veggies as well though. I am wondering how I should adjust the cook time for white rice? I haven’t tried it that way yet myself, but I’d adjust it maybe 3-5 minutes less. Can you make this with boneless skinless chicken breast? If so any changes in cooking time? Thanks in advance for your answer. Yes, you can use chicken breasts! Cooking time will be the same. Can I make this on stove top or crock pot? Yes! I haven’t tried it on the stove top, but to make it in the crock pot, just combine all ingredients and cook for 6 hours on high or 8 hours own low.